I ordered a micro fleece Snuggie tonight. I refuse to be ashamed!! I think the commercials are just stupid. However, while on vacation, Mister’s sister had this amazing blanket with sleeves. I wrapped up in when I was a little chilled and OH MY GOD I was hooked! Not only was it incredibly warm, but I was not restricted. I did not make coffee, knit, or play catch. I was, however, quite comfortable adjusting my arms without having to adjust the blanket. Despite the horrid marketing, this product is actually really good. I should be a proud owner by the end of the week! 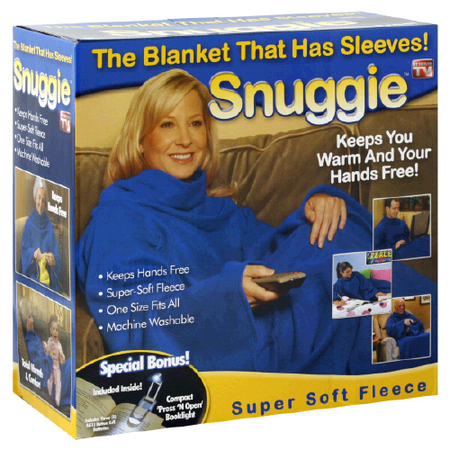 If you are a proud Snuggie owner, I would love to hear your Snuggie Success Story!